SEMCOR is the Midwest’s number one source for a broad range of high-quality products for industrial use. We’re a proud supplier and fabricator of superior fluid handling products that can resolve any fluid control issue. SEMCOR has been in business since 1907 — we have the experience and expertise to help you choose the right product for your needs. As a regional company based in St. Louis, MO, we can provide prompt, attentive service to our customers across Missouri, Kentucky, Iowa, Indiana, Illinois and beyond. 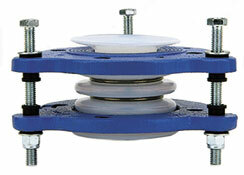 PTFE lined expansion joints are used to compensate for movement, misalignment and/or vibration in piping systems. Polytetrafluoroethylene (PTFE or TFE) is a synthetic material that can be used to line expansion joints to increase the joint’s chemical, corrosion and heat resistance. Examples of industries that make use of TFE lined expansion joints include piping, HVAC, chemical and petroleum. SEMCOR is pleased to offer TFE lined expansion joints from Resistoflex. They have been at the forefront of PTFE-based technology for more than 60 years, having invented the world’s first PTFE lined hose in 1953. We encourage you to take a look at our current selection of TFE lined expansion joint products. Please contact us for more information or to request additional product literature.